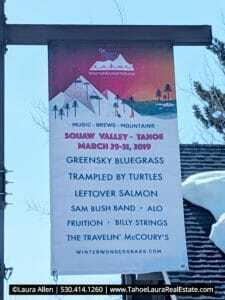 Celebrating its fifth year, the Winter Wonder Grass Music Festival is back starting Friday, March 29, 2019 in Olympic Valley. If you get here early, on Thursday, March 28, 2019 from 2-5 p.m. listen to Horseshoes & Hand Grenades at the Village at Squaw Valley for FREE! Here’s the line-up for the three-day event! Doors open at 1:35 p.m. The Event Venue is at the west end the of Squaw Valley area Vilalge at Squaw Valley – Look for the stages and tents! Cost: Ticket Pricing will vary depending on the ticket package you select. Beer and Beverage/Food prices will vary depending on the ticket/item selected. Must be 21+ age for beer/adult beverages/tastings. Our spring weather can be unpredictable – sunshine, rain, even snow. If you’re headed up here to the greater Tahoe City – Truckee area for the Winter Wonder Grass Festival my suggestion is to dress warm. Dress in layers, and if you don’t already have a plastic rain poncho (most hardware stores have them) that can fold up and fit in a pocket, buy one now. I can tell you from personal experience, while the rain poncho with attached hoodie will not make the best dressed list, the sheer, light weight plastic material will keep you dry and comfortable all day. You won’t even mind being in the rain, or snow if it happens. 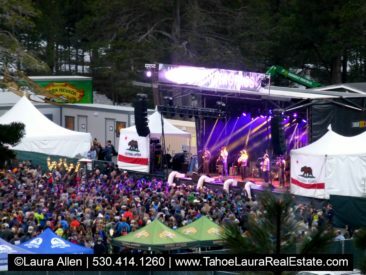 If you’ve been looking for a reason to come up to Lake Tahoe the annual Winter Wonder Grass Blues and Brews music festival in Squaw Valley this weekend will be a great way to have some fun in Tahoe! 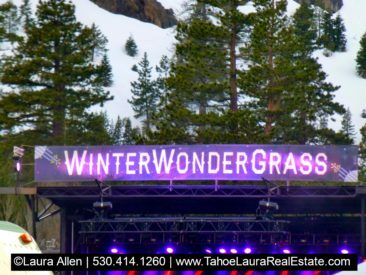 Come out to the Squaw Valley this weekend and enjoy some amazing talent at the Winter Wonder Grass Festival!